The first few months in the Governor’s Natural Resources Office have been quite eventful to say that least. From Executive Orders to agency legislative concepts, in my short time here I feel like I’ve been exposed to the guts of how the government works. I’ve been thrown head first into the “Oregon Way”, which describes our processes of implementing policy using collaboration and inclusion. I’ve found that there’s a committee, council, board, commission, or task force for just about everything and everyone! I’ve only just discovered the wide variety of stakeholders that provide diverse perspectives in natural resource policy-making. It’s truly amazing to see the collaborative process of juggling and satiating groups with completely different agendas regarding the same policy or topic. Given the time of year, Governor Kate Brown’s Recommended Budget is a major discussion item, primarily the proposed creation of the Oregon Climate Authority (OCA). The OCA would absorb the Oregon Department of Energy, assume the operations of the Governor’s Carbon Policy Office, and acquire greenhouse gas emission tracking and reporting tasks at the Oregon Department of Environmental Quality. It would also provide a market place Oregon’s Carbon Cap and Invest program (should that legislation pass in the 2019 session). There was also a suite of proposals to aim to improve state water quality. 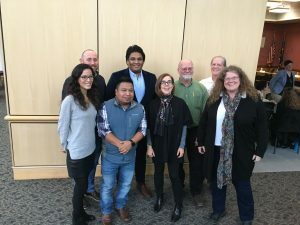 I had the opportunity to observe budget discussion in a variety of different contexts; the Ocean Policy Advisory Council (OPAC) and the Environmental Justice Task Force (EJTF) are two that come to mind. OPAC is a body composed of conservation, natural resource, and local government stakeholders. This council advises the Governor about ocean policy, such as ocean acidification mitigation and oil and gas exploration on the Oregon coast. EJTF is composed of members who represent and advocate for minority communities, low-income communities, environmental interests and industry groups. The Task Force guides agency environmental decision-making to protect “Environmental justice communities”, which are communities traditionally underrepresented in public processes. OPAC’s primary interests were grounded in how the Governor plans to address the issue of ocean acidification and her position on future offshore oil and gas legislation. Because the words “ocean acidification” were not in the budget, it was important to communicate that the creation of the OCA, and a carbon cap and trade program, seeks to address the ultimate root of the problem, which is global climate change. As a lead policy maker in the state, the Governor has the power to guide long-term, institutionalized solutions and for that reason, focuses less on implementation of localized restoration efforts or research initiatives. The Council also felt to make it clear that they were going to recommend the Governor support the permanent ban on offshore oil and gas legislation. OPAC appeared to be very concerned with high-level topics, with big solutions, as chronic problems in out oceans often require. I carried what I had learned interacting with OPAC, into the EJTF meeting the following week. I was surprised that the Task Force was mostly interested in the budget funding allocated to eliminating the Department of Environmental Quality’s (DEQ) water quality permit backlog. They asked if minority communities, particularly Latino communities, had been disproportionately impacted by this backlog and how DEQ planned to prioritize queue clearing. They were also curious about how DEQ was handling air quality violations following a fire that had occurred at an auto-dismantling facility in the Cully neighborhood earlier this year. I noticed that the members on the EJTF were primarily concerned with local issues impacting very specific communities, rather than the overarching issue of climate change. This is likely due to the fact that the predominate issues facing environmental justice communities, are the result of outsourced environmental impacts of development. The main thing I gathered during my interaction with these two different groups is that the environmental issues that a group of people deem as important is completely dependent on the scale and distribution of the problem. This bit of knowledge is important to consider when interacting and advocating for each group, and also when it’s time for the Governor to appoint new members. In the short time with the Governor’s Office, I’ve found that every commission, board and task force provides a place for each stakeholder group to ensure their interests are advocated for in the natural resource policy making process. Each provides a unique perspective to a problem that the collective aims to solve. Thanks for your post, Bryn. It sounds like you are already getting exposure to quite a diversity of topics, people, and processes! It’s great to know that even in your short time so far, you have found that each stakeholder group has an advocate. Thanks for sharing! Thoughtful and insightful post! Thank you for reporting on upcoming legislation and the work of the Environmental Justice Task Force. Sounds like you are learning tons, and have tons to teach others.